Donor recognition brought to life! 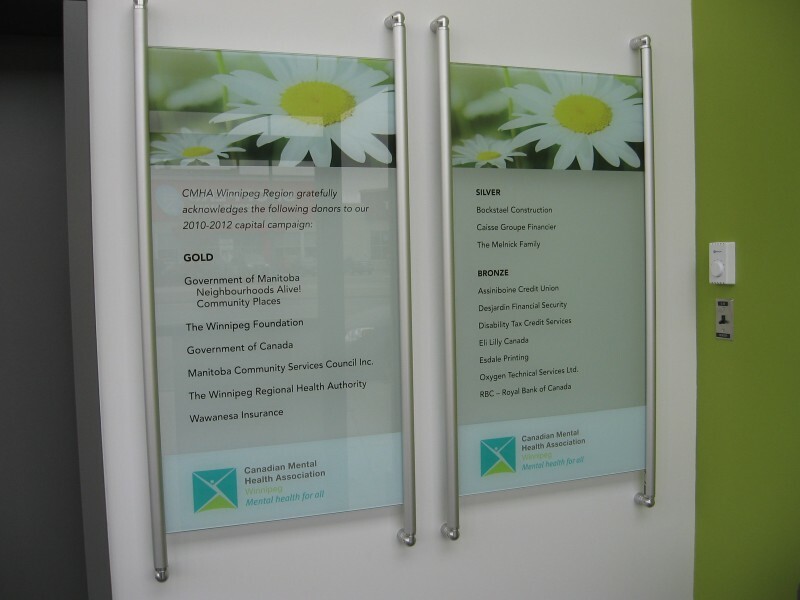 The Canadian Mental Health Association (CMHA), Winnipeg office, has undergone some exciting developments recently, not the least of which is its move to new offices at 930 Portage Avenue in Winnipeg’s west end neighborhood. The bright, contemporary facilities have been completely redesigned to accommodate the needs of staff and clients alike, and this undertaking was made possible in large measure through the generous contributions of government, corporate and individual donors to the organizations capital campaign which concluded this fall. To recognize these gifts CMHA Winnipeg Executive Director Nicole Chammartin selected Planned Legacy to design and fabricate a recognition display that would complement the facility’s new décor and colors, and which would also be flexible enough to allow for easy and economical updates should new donors step forward. Using 8 mml tempered glass panels supported in channels in vertical aluminum tubing, the display showcases donor names and graphic images using durable vinyl graphic film that can quickly be modified to add new names or images. For more information on this or other Planned Legacy projects visit Planned Legacy at www.plannedlegacy.com, call us toll free at 866-882-3580 or email us at solutions@plannedlegacy.com. The Monterey Institute of International Studies (MIIS), a graduate school of Middlebury College, is a dynamic organization that annually produces graduates who go on to be leaders in all areas of business and commerce, working for some of the world’s largest and most successful corporations. Recently, MIIS decided to move ahead with the development of a comprehensive recognition display that would serve multiple purposes. The display, which would integrate an architecturally designed donor wall with an interactive multimedia presentation, is an innovative blend of technology and craftsmanship that is helping MIIS share its story and achievements with visitors around the world. According to Kathryn Ann Joyce, Director of Corporate & Foundation Relations at MIIS, the area where the display is situated used to be dead space but is now always busy with people. “The wall has brought that building to life,” says Joyce. “People who were not interested initially in having their profiles and pictures up are now very interested in it. And corporations are very excited about being featured, too, and feel that they’re seeing an increased interest in them from students,” she continued. The architectural portion of the display features a series of six large glass panels, each showcasing donors within various gift categories. Highlighting the display is a world globe that creates a dramatic relief background. When visitors approach the display a large 55” interactive LCD monitor invites them to experience the multimedia presentation by touching one of the interactive navigation buttons. Presentation modules include A World Of Influence which features global regions where MIIS graduates are at work; Alumni of Distinction; and Tomorrow’s Leaders. Another module is Our Corporate Partners that showcases some of the major corporations that have hired MIIS graduates, and which feature profiles of those corporate partners. “The entire project development experience was seamless”, says Kathy Joyce. “I was amazed that we were able to develop such a comprehensive project so easily. And being featured in the multimedia presentation has become somewhat of a campus status symbol, as students and staff vie to be included in one of its segments”, she added. For more information on the Monterey Institute for International Studies integrated recognition project or other Planned Legacy projects please contact Planned Legacy at 866-882-3580 or by email at solutions@plannedlegacy.com. Donor Wall Recognition Display Brochure 2011 hot off the press! When you’re installing as many recognition displays and electronic multimedia presentations as Planned Legacy, it’s difficult to keep your promotional brochure current. So it was back into production for us with photos of new displays, enthusiastic testimonials from satisfied clients and lots of helpful information for those organizations wanting to add innovation and style to their current recognition program. As you review our new 2011 Planned Legacy Donor Wall and Recognition Display Brochure you’ll be struck by the sheer variety of designs, representing a real cross section of scope and cost. Featured in the brochure are architectural and multimedia donor walls, interactive kiosks and enclosures, digital signage, memorial displays, Walls of Fame, interactive electronic wayfinding systems, specialty recognition and naming plaques, Synagogue displays and corporate recognition. Every organization is concerned about controlling costs, no matter what size the budget, and Planned Legacy continues to prove that you can recognize donors, honor champions and showcase achievement without breaking the bank. You can download our 2011 brochure here, but hurry because we’re already starting to think about the 2012 edition! Also available on the downloads page are the Donor Wall Planning Guide and our new e-book the The 5 P’s of Successful Donor Recognition. If you combine the ideas found in all three of the above publications with your own fabulous thoughts, you’ll be well on your way to creating the ultimate donor wall or recognition display! After conducting a thorough analysis of their recognition program and determining their requirements, Brigham & Women’s Hospital (BWH) in Boston, Massachusetts understood that their first significant recognition display needed to make a statement while also providing exceptional recognition to its supporters. 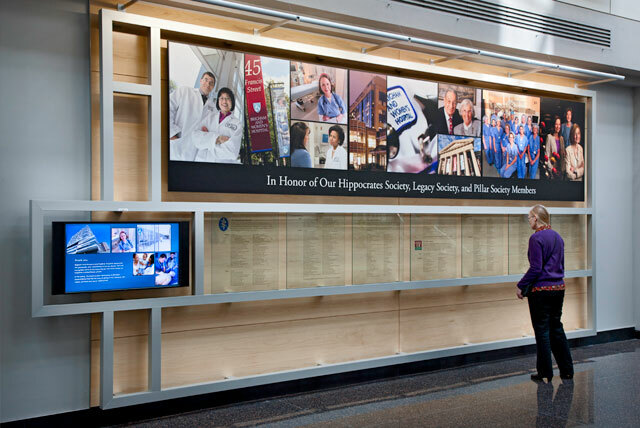 The new display would have to communicate the Hospital’s history and Harvard University affiliation while also recognizing and celebrating the thousands of individuals and organizations who have continued to support BWH since it was established. And they wanted to do this with an architectural display that combined both tradition and technology. The firm that BWH selected to fulfill its vision was Planned Legacy, chosen for its leadership in display design as well as multimedia programming. The environment for the new recognition display was to be the Hospital’s refurbished lobby, a high traffic area with thousands of daily visitors. After extensive meetings and collaboration with Development and facilities staff as well as architects and other Hospital leaders, Planned Legacy designers created an engaging concept of three adjacent displays; two for donor and Legacy recognition, and a third for use by the Hospital’s Public Affairs department. Making liberal use of wood-grain laminates, glass and custom fabricated metal, the displays were designed to complement the work of the Hospital’s architects, who were simultaneously remodeling the Hospital’s lobby and Emergency Department entrance. The first display honors contributors to the BWH Hippocrates Society and Legacy Society as well as the organization’s Pillar Society. Donor names are highlighted on tempered glass panels beneath a large display-wide panel with full color graphic images of staff, donors and Hospital leaders. This graphic area is backlit with strategically placed lighting that frames the entire display from the top down. Accenting the display is a 40-inch LCD monitor which features an informative and entertaining interactive multimedia presentation that includes a compelling message from the Hospital, achievements and initiatives, donor recognition and donor profiles. Electronic donor recognition. The key to success is in the planning. 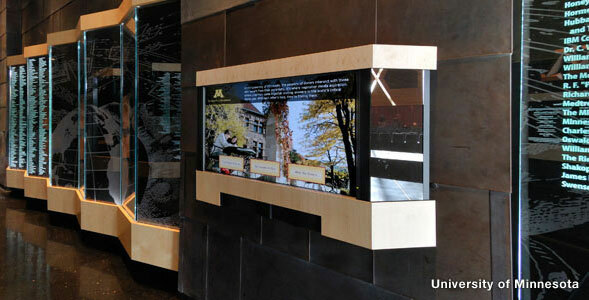 Multimedia recognition display at the University of Minnesota. The key to success is in the planning. Electronic donor recognition is now used by leading non-profit organizations throughout the world and it is fast becoming an essential element of any donor recognition program. The superior attraction capabilities of electronic donor recognition displays enable nonprofits to engage and recognize donors, contributors, volunteers and board members with video, audio, photographs and text, in a fashion that not only saves time, but also save space. And because the digital displays are quick and easy to update from any Web-connected computer, they are always current. Donor names and profiles, major donor recognition, current and historical video, giving programs, fundraising events, volunteer opportunities and success stories are just a few of the options available with electronic recognition displays, which are really limited only by your imagination. The key to building a beautiful and successful electronic recognition display is in the planning, not just to make sure you meet your budgetary and time-line objectives, but also to be certain that it remains a relevant and engaging destination at your organization for years to come. Is your organization ready for electronic recognition? Location, Location, Location! Where will you set up your display for maximum exposure? Content Is King! What content do you have? What will you develop? Will your display be touch screen or self-cycling? Will your display be integrated or self-standing? 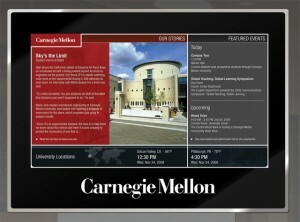 Will you integrate your recognition display with your Web site? How will you select a vendor? How will you handle day-to-day content updates? How will you market your new display and your important messages? Read More: 10 To-Do’s To Ensure Your Electronic Recognition Display Informs, Inspires, Impresses and Involves! AFP and Planned Legacy: A Winning Combination In Baltimore! AFP & Planned Legacy: A Winning Combination In Baltimore! The proverbial “great time had by all” could easily describe the recent Association of Fundraising Professionals’ International Conference that Planned Legacy was an exhibitor at in Baltimore April 10-13, 2010, and from my perspective the mood was positive, confident and enthusiastic! Over 3600 fund raising professionals were in attendance, including some from Australia, Europe, Asia and other far flung locales where giving is just as important as it is in North America. However, no matter where the visitors were from, they were all there to participate in the numerous plenary sessions, listen to keynote speakers such as Archbishop Desmond Tutu, take in the local sights and attractions and stop by well over 200 exhibitor booths to learn about new ways, products and methodologies to strengthen their message and improve strategies to reach their respective donor constituencies. Economists and financial prognosticators from around the globe would do well to take in one of these conferences because just listening to the comments of the attendees can give you a great sense of what’s happening in the “real” world and, based on what we heard, things are starting to look up in the philanthropy sector as budgets become looser, projects get moved off the back burner and delayed plans get resurrected. At the Planned Legacy booth we spoke to representatives of over 100 different fund raising organizations and, while a lot were no doubt just “kicking the tires” the prevailing sentiment was optimistic. In fact, over at the AFP Jobs Board, the wall was covered with career opportunity postings, a marked change from last year’s conference in New Orleans where attendance was significantly less, job postings were far fewer and the mood was subdued and cautious. What a difference a year makes!! The Baltimore AFP Conference was also a great opportunity to introduce James Graham, the newest member of the Planned Legacy team. James is a Business Development Manager with a lot of great experience in both architectural donor displays as well as electronic multimedia systems, so he’ll be a great asset to Planned Legacy clients on the US eastern seaboard, which represents most of his sales territory. James comes to us from another donor recognition company where he enjoyed a great career and we’re confident that all his skills and experience will prove to be a great asset for our growing family of Planned Legacy clients. That’s it for me. Look for Jared Novoseller, our Toronto-based Business Development Manager at the Association for Healthcare Philanthropy Conference at the Toronto Hyatt Regency April 18-20, 2010. He’ll be there with Carla Borges, our interior design specialist who’ll be in Toronto to attend the Society For Environmental Graphic Design conference.